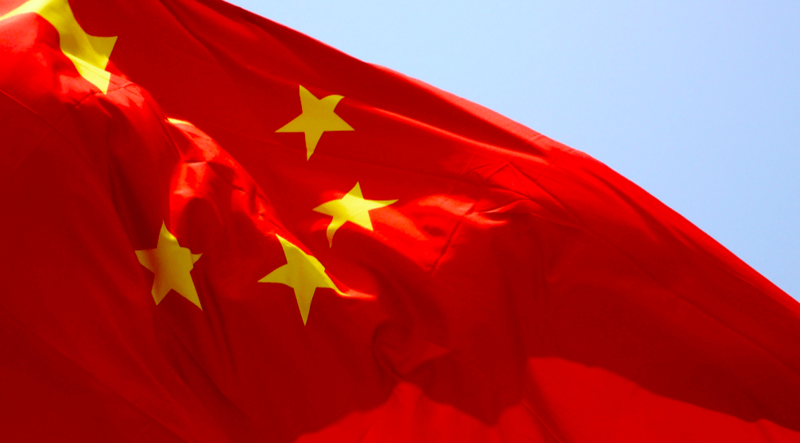 tl;dr: The Chinese venture capital market may be larger than we thought. Understanding the Chinese venture capital market can be difficult, as estimates for venture activity in the country often vary widely. For example, two well-respected sources place the country’s 2015 venture capital deal volume at 403 and 1,555. The reporting groups, KPMG and Preqin, peg aggregate venture capital deployed in China during 2015 at $27.4 billion and $37 billion respectively. Unsurprisingly, the group that reported more deals also estimated more total aggregate investment. While different tracking groups may disagree on China’s venture deal totals, there appears to be consensus among industry watchers that the Chinese venture scene lags the United States’ own ecosystem. For example, the same group that measured venture capital investment in China at $37 billion in 2015 placed similar activity in the United Sates at $68 billion over the same time period. However, the variance between estimates of venture activity inside of China is significant. The implication of the gap between differing estimates is that the Chinese market is misunderstood in some way; 403 and 1,555 2015 deals cannot both be correct at the same time. Building on our previous attempts to analyze the investment climates of the United States, Southeast Asia and India, today we’re taking a longer look at the Chinese venture capital market in terms of aggregate capital deployment and deals executed. To better understand the Chinese market, I turned to funding news articles reported in Chinese and reputable Chinese startup databases like Itjuzi and 36kr. By sieving through a massive amount of funding data, I was able to parse through several quarters of information to determine how large the Chinese venture market actually is. 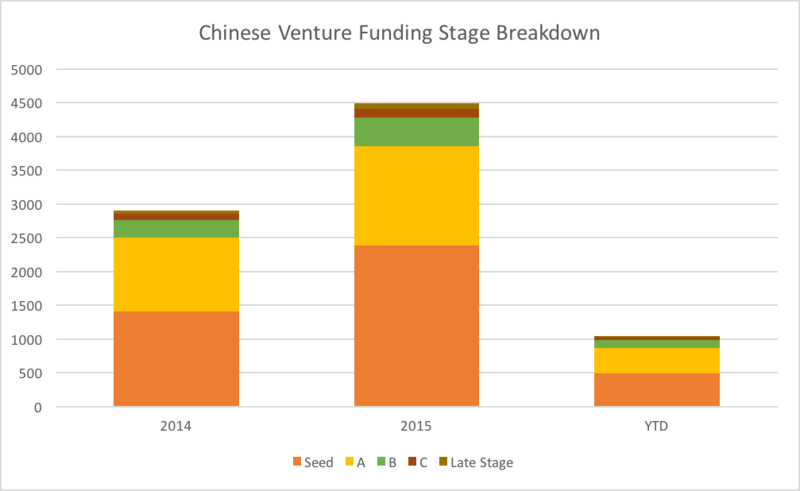 My analysis of Chinese funding data has a simple conclusion: the venture market in China is massive. In 2015, there were 4,489 deals in the country. Compared to KPMG data covering the same time period, the Chinese figure is just 9 percent short of the United States’ own tally. The number of Chinese venture deals grew from the end of 2014 to the closing quarter of 2015, which posted the first sequential decline in more than a year. 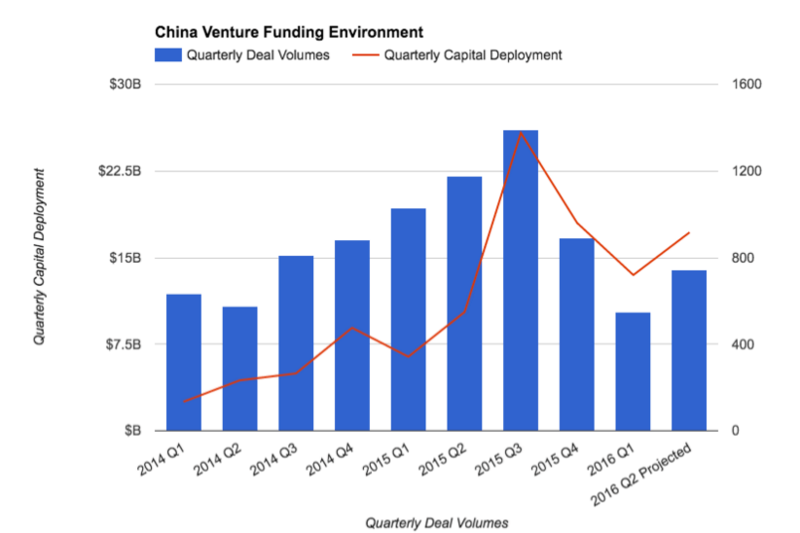 Venture capital deployment in China totaled $60.5 billion in 2015. That’s around $7.5 billion lower than the Preqin estimate for the United States during the year. KPMG reports an even higher gap in favor of the United States’ market. While the past year set records in China, capital deployment and deal volume in the country fell sharply in the fourth quarter of 2015. That decline was not isolated to China. Similar corrections appeared in other markets, such as the rest of Asia, and the United States. Where Was The Money Invested? Media coverage of the Chinese startup scene, as with others, can feature outlandish product claims, funding exaggerations, and unpredictable government policies. Those issues did not seem to slow the pace of investment in China during 2015. There were 2,383 2015 Chinese seed rounds, making up a full 53 percent of all venture deals in China that year. So far in 2016, that percentage has fallen to 47 percent. The decline in share of seed-stage rounds as a percent of the aggregate could indicate that investors are placing bets at later, safer funding stages. Continuing the thought, if funds move “up the ladder,” doubling down on startups that have proven product-market fit, larger, later deals could become more commonplace. For now, that remains speculation. Does the decline in seed rounds as a percentage of all rounds and slipping aggregate deal volume imply the end of China’s startup boom? Looking at economic fundamentals, I believe the opposite is true. I’d argue that economic observers of China need to expand their focus from the country’s slowing GDP growth. Consumer spending is expected to grow inside of China over the next several years, after being kept artificially low for decades. As Chinese startups often sell predominantly to the Chinese market, rising consumer spending could mute the impact of slowing GDP growth. Factors other than consumer spending are at play. Previously untapped rural markets are undergoing an e-commerce revolution at the moment, becoming increasingly ready to embrace new technology. With rural Internet penetration at only 30 percent nationally, cities beyond the first and second tier may continue to develop new markets for Chinese startups. A venture capital slowdown is not always a bad thing. A lowered normal in venture funding could force Chinese startups to focus on sustainable businesses rather than boosting vanity metrics. Perhaps after the boom of 2015, some pullback is not only unsurprising, but beneficial. For now, keep in mind the wide range of estimates concerning the Chinese venture capital market. No single number or graph tells the full story. Cheung Ho Yeung is a member of the Mattermark data team. Featured Image via Flickr user Max Braun under CC BY-SA 2.0. Image has been cropped.